I was annoyed when I entered the school room that housed what I thought was the Muslim Womenpreneur Spring Bazaar. I had looked forward to seeing enterprising women who were trying to set up little businesses to make some money. I wanted to support their initiative. I had gone to a couple of such shows in past years and enjoyed the friendliness of the women. I remembered being in Egypt and Jordan where aggressive men were the only shopkeepers. Honestly, they grabbed us by the arm and almost pulled us into their shops. I was looking forward to the gentleness of female sellers. But last week, the Bazaar was different. The women were still gentle, but men were outside in the cold barbecuing. They were inside sitting behind the stalls. There were still a few women alone at booths but there were men, not many, I must admit, but a few, and I had expected none. What was happening? Were they there to grab whatever money the women made? To dictate prices and decide what was to be sold? I asked the manager of the Bazaar. 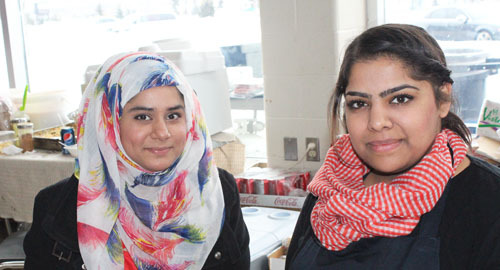 Mervat explained that this year’s bazaar was a family affair. Husbands and sons were there to help. The title was not misleading and the women appeared in charge. The bazaar was interesting. 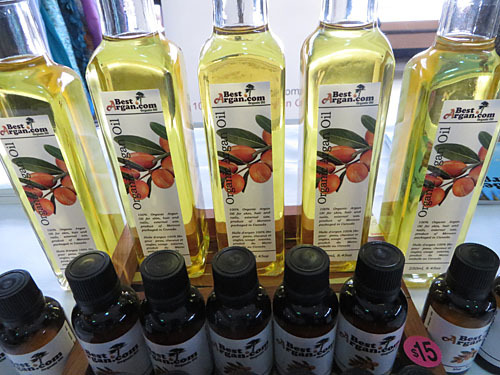 I discovered that the oil from the nuts of the argon tree was an ancient 3500 year old remedy for dry skin and hair. It was also good, like olive oil, for dipping bread. It was only grown in Morocco. Later I checked the web and discovered that argon oil was originally made from the droppings of goats that had ingested the kernels. Today that step has fortunately been eliminated. 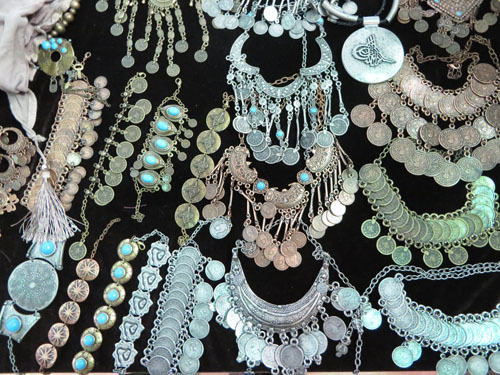 I found pieces of Bedouin embroidery and jewellery from Egypt for sale. I’ve been a collector of embroidery and have a book at home with pictures of Bedouin jewellery such as this. I have a Bedouin wedding dress. It was a thrill to find them here at the bazaar. 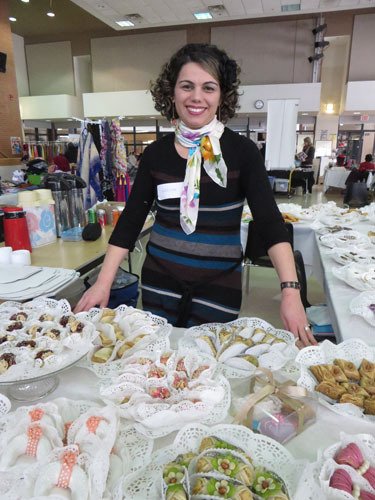 One booth showed the handiwork of Karima of Oakville’s Maison Delice Bakery. Each piece was a work of art. Copyright ©2014 Ruth Lor Malloy. 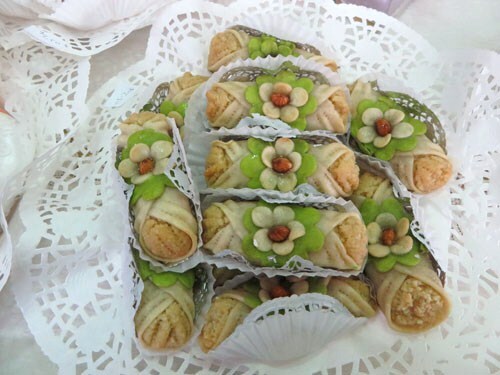 Chef Karima was there in person, explaining how long it took to make each one. I was already full of a delicious lasanya so didn’t have room to try one. I wasn’t attracted to the clothing for sale. It just wasn’t my style. 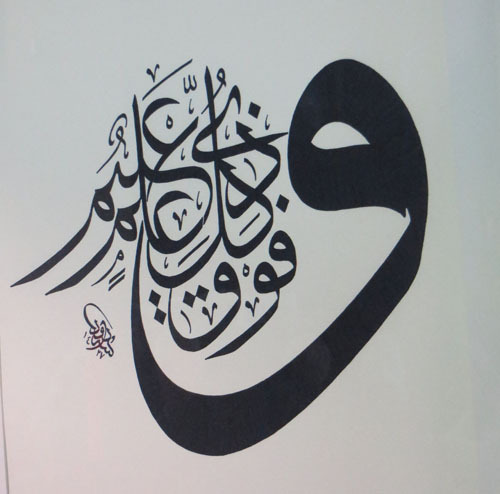 But the Arabic Calligraphy by Islamic Hands was stunning. They were of prayers and Koranic verses, but executed into pictures. I was interested in the hijab head scarves. I find them very attractive and graceful. A couple women happily posed wearing the scarves. I bought a ready-made set that needed no pins or elaborate arranging. It was only $5. Scarves were very cheap. While waiting for the dancers, I happened to sit beside a man with an untrimmed beard and sparking eyes. He was taking care of his little girl, he said in Canadian English. His wife was shopping. He was of Bengali origin from Libya who had arrived in Canada while still very young. His wife was wearing a full black robe with her face covered except for the eyes. I asked, where did women wear their fancy jewellery and beautiful clothes if they have to keep themselves completely covered? The women have their own parties where they wear them, he answered. I guess I was still feeling prejudiced against Muslim men at that point and I asked him if he had the final say on what his wife bought. She buys what she wants, he replied kindly. His wife returned and confirmed that she made her own choices. Several, but not all, women at the bazaar were wearing the face-covering niqab also but some women were wearing jeans with their heads bare. It all seemed to be a matter of individual choice and age, though the Bengali’s wife must have been in her late twenties. “I wear the niqab because of my religion,” the wife said. She was wearing it before she met her husband, while she was still in school. She had been educated in an Islamic school in Toronto. The husband said he made sure she wore the niqab because she wanted to. He didn’t want to marry her if someone forced her to wear it. I took their picture and they said I could publish it on my blog. I said I would send them a copy of what I wrote before I published the picture. Unfortunately, I lost their address so until I hear from them, I can’t show you what they look like. 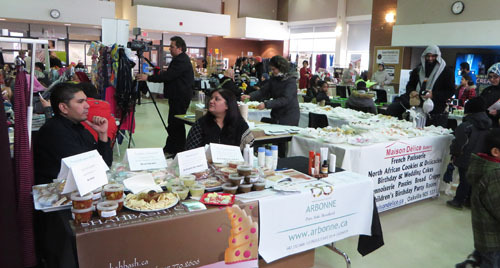 It was great to talk with several people at the bazaar and to have a chance to challenge my own prejudices. I would have liked to ask more questions of the Bengalis. Please keep consulting www.torontomulticulturalcalendar.com for more opportunities to meet people you would not ordinarily encounter. Follow us on Twitter.com/torontomulticul for uptodate reminders of events. Do tell us about your adventures and opinions on “Post a Comment” below.